Dolly to finesse your trailer into any tight space! Floor to handle bar measures 46"
Strong and agile for trailer-management excellence! Heavy-duty steel is strong enough to easily move a load of up to 600 lbs. over most any terrain. Just what you need for easy maneuvering of utility, boat, cargo, jet-ski and other small trailers. Sturdy, easy-rolling 10" x 3" tires. Measures 27" x 13" x 47"h. Weighs 30 lbs. From floor to hitch ball is 15". Wheel to wheel (wide) is 28". From floor to handle bar is 46". Floor to ball hitch is 15"
Measures 27" x 13" x 47"h.
End the hassle and strain. Order now! Guide Gear Heavy Duty Trailer Dolly, 600 lb. Capacity is rated 3.6 out of 5 by 13. Rated 2 out of 5 by Bob R from You get what you pay for ! I got this dolly to move my wood splitter around from my shed to my woodpile. Only about 70 feet. It does that. BUT when I ordered , the first time, I was fooled by the description and the picture. First the description. My definition of heavy duty and their definition of heavy duty are no way the same. The metal parts are fine but take a good look at the picture and notice the wheels. In the picture it appears to have "heavy duty" steel wheels but it comes with cheap plastic wheels with no bearings just the plastic drilled for the axle, and I can only hope they will hold up over time. Also the diameter of the wheels seem much larger than the wheels I recieved. I mentioned that I had ordered more than once. That is because when I received the first one It was missing most of the hardware , there was a big hole in the box, and the one hub on the cheap plastic wheel was drilled off center. I called customer service and they sent out another one (this was good) and was told to make a complete one and return the rest. When I received the second one it was complete but one of the wheels suffered from the same out of round axle hole as the first.So as I stated in the title you "get what you pay for" !! Rated 4 out of 5 by Luke from Good item,problem was with shipping Trailer dolly will come in handy to move trailers around,especially my wood splitter that weighs a ton!!! Returned first order,no instructions or parts to put it together. We're very helpful with the problem and shipped another quickly. Thanks!!! Rated 5 out of 5 by wyatt earp from great back saver My trailer is 7x14 this lets me move it in the small space I have all by myself. Saves time and my back. Rated 1 out of 5 by bud1 from very disappointed Piece of junk. Parts missing and no assembly instruction or diagrams. Paint peeling out of box. Wheels covered in mildew. 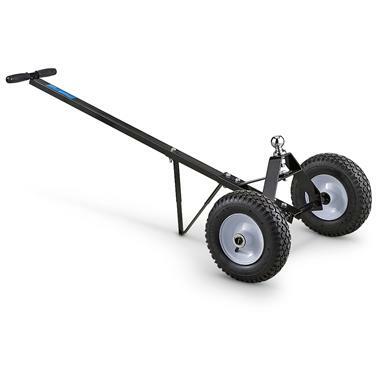 Guide Gear Outboard Boat Motor Carrier Dolly, 130 lbs. Designed for moving motors up to 130 lbs. Makes light work of moving heavy boat motors! Smart way to carry a spare!